The Greater Hammond Chamber celebrated the life and legacy of Dr. Anne Ferguson by honoring seven special women during the 2018 Annie Awards luncheon, sponsored by Tangi Lifestyles and Fidelity Bank/NOLA Lending Group. Mari Ann Callais with Delta Delta Delta Fraternity and The Catalyst Agency Speakers Team, Erin Moore Cowser with Southeastern Louisiana University, Lacy Landrum with the City of Hammond, Stacey Neal with Louisiana Economic Development and Susan Spring with Regina Coeli Child Development Center were the recipients of this year’s Annie Awards. In addition, the Chamber also recognized Freda O. Green with an honorary Annie Award, and Michele Kidd Sutton as the 2018 Legacy Award winner. “I’m proud to be part of an organization that not only honors the legacy of Dr. Ferguson, but also recognized the importance of women in business and continues to honor these incredible women who work hard every day for the improvement of our community,” said Chamber Chairman Elsbet Smith Hollywood. Freda Green, at the age of 95, still leads by example when it comes to community involvement. She has been involved in more than 30 organizations over the years, using networking as an opportunity to make lasting friendships and better the community. The Legacy Award recognizes that the women previously honored over the years never stopped making an impact in their field and on the individuals around them. The 2018 Legacy Award winner, Michele Kidd Sutton, was first honored with an Annie Award in business 19 years ago. Since then, she has gone on to become the President/Chief Executive Officer of North Oaks Health System, one of the parish’s largest employers and a designated Level II Trauma Center. She is described as a passionate leader and advocate for education, healthcare collaboration and community service. Special guest speaker at the event was Louisiana State Representative Julie Stokes from Jefferson Parish, who shared her inspiring story and words of wisdom with attendees. Stokes told how she became involved in community and public service through her career as a certified public accountant and her dreams of becoming the Louisiana State Treasurer – dreams which were halted when she was diagnosed with triple negative breast cancer. She shared several lessons she learned through her journey - that when one door closes, God can open another one; that in every moment of misery, there’s always an opportunity for ministry; and that joy is a choice. “You can have cancer and be miserable. Or you can have cancer and be happy,” Stokes said. Stokes encouraged the Annie attendees that success is not linear and the answer they need may be right in front of them. Even taking a two degree turn will put you on a vastly different long-term path, she said. United States Senator Bill Cassidy extended his congratulations and issued a proclamation honoring the 2018 Annie Award winners, which Southeast Region Field Representative Kathy Stuart presented during the luncheon. Check out the June edition of the Tangi Lifestyles magazine for a special feature on the 2018 Annie Award winners. Annie Award photos were taken by Phillip Colwart. Follow the Greater Hammond Chamber’s Facebook page for more pictures from the event. 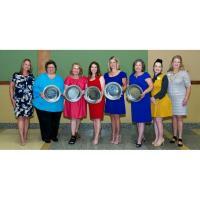 Photo Cutline – The Greater Hammond Chamber honored five special women during the 2018 Annie Awards Luncheon. Pictured from left to right are Chamber President and CEO Melissa Bordelon, award winners Mari Ann Callais, Erin Moore Cowser, Lacy Landrum, Stacey Neal and Susan Spring, Chamber Chairman Elsbet Smith Hollywood, and Annie Awards Committee Chairman Elizabeth Reno. Photo by Phillip Colwart Photography.